It’s like something out of Exodus. 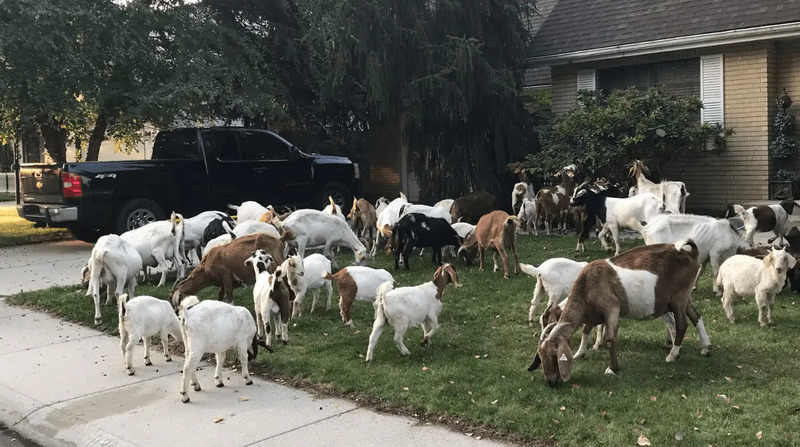 This morning, residents of Boise, Idaho, awoke to find a group of nearly 100 goats running wild in the streets. Much like a swarm of locusts, the goats moved from home to home, eating everything they could snap their indiscriminate jaws around. The craziest part: No one knows where these goats came from. Eventually, the herd of goats was rounded up by a truck owned by “We Rent Goats,” according to local news reporter Joe Parris. It looks like the goats had been in an enclosure close to the neighborhood where they ran loose, and somehow broke free (perhaps they chewed their way out?). Now, we know this might be cause to panic—after all, goats have a certain dark connotation—but we want you to rest easy. These goats have been contained, and there’s no longer any threat, natural or … otherwise, to your home.